The draw event will take place on 15 June 2011 at 12pm (local time) Belgrade, Serbia. 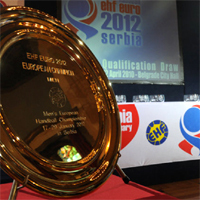 The Men’s EHF EURO 2012 will take place between 15 and 29 January 2012 in the four Serbian venues Belgrade, Nis, Novi Sad and Vrsac. In total 16 teams are qualified for the final tournament; 14 teams qualified from the Qualification groups, defending champions France and organisers Serbia. The draw will be carried out by Tor Lian, EHF President and Michael Wiederer, EHF Secretary General. The two will be assisted by the players Dragan Skrbic (SRB/ESP), Marko Vujin (SRB), Uros Zorman (SLO), Igor Vori (CRO) and Christoffer Rambo (NOR). Find more information about the seeding here. The playing venues for the Preliminary Round have been allocated. According to the regulations of the EHF EURO, hosts Serbia could select four teams and allocate them to the four EHF EURO 2012 Preliminary Round venues. In step one the remaining three teams of Pot 4 are allocated to row 4 in the remaining three Groups A, C and D.
In step two the remaining three teams of Pot 3 are allocated to row 3 in the remaining three Groups B, C and D.
In step three the remaining three teams of Pot 2 are allocated to row 2 in the remaining three Groups A, B and D.
In step four the remaining three teams of Pot 1 are allocated to row 1 in the remaining three Groups A, B and C.